For this month's ATOM AotM, we examine something that even the rest of the technology industry has virtually no awareness of, and the US public is entirely oblivious of, even though we have a President from the construction industry. The US construction industry has had no net productivity gain in the last 70 years. Even worse, it declined by 50% over the last 50 years. Construction should be seen as a type of manufacturing, as most construction is not devoted to anything highly customized or unusually complex. Yet, manufacturing itself has risen in productivity by 800% over the same period that construction has not risen at all. A combination of organized crime, government graft, and an anti-productivity ethos have contributed to this epic failure. Given that construction is about 7% of the US economy, this is troubling. Imagine if that 7% was 16x more productive (i.e. merely keeping up with manufacturing). Americans, particularly urban Americans, don't realize that they could have thrice the square footage for the same price if this sector merely kept up with manufacturing. There would also be several hundred thousand more jobs in construction, and much broader home ownership. Meanwhile, outside of the many biases of the Western media, there is an amazing example of supreme construction efficiency. China has grown at 7% a year over the last 20 years, even as the US has shrunk at -1% a year (click image to enlarge). The productivity of China has greatly enlarged the size of its construction sector, to the extent that it is 20% of China's economy vs. just 7% in the US. While the two countries are a different stages of growth and China is still at a much lower absolute level, the differential is still immense. Normally, in any industry, such an immense productivity differential leads to the productive country exporting products to the less productive country, swiftly driving local unproductive businesses to their deserved demise. Construction, however, produces a product that is not transportable, so a productivity normalization has not happened. At least not yet. But this high of a differential eventually finds a way to engineer a normalization. Modular construction is one method where parts are manufactured, and then assembled on site. China could start exporting this to the rest of the world. Here is a Spire Research report on the advances in China's construction technology. The Western media, in its hubris, is quite willing to criticize China for building entire cities 10 years before they are needed. How often have we seen stories about empty cities in China that take a few years to fill up? By contrast, the United States (and California in particular) does something much worse, which is to build structures 20 years after they are needed. Given the choice between these two schedule misalignments, China's approach is vastly preferable. Beyond this, the costs of US ineptitude are about to become more problematic. The eCommerce revolution is exposing the massive misallocation of land toward retail space, that is a uniquely American distortion. Part of this is due to a peculiar depreciation schedule in the tax code originating in 1954. The abundant land in the US interior led to the same lopsided usage of land in California, leading to the grotesque situation we have today where ultra-expensive housing resides next to vast, empty parking lots. High California housing prices are the product of extreme artificial supply restriction, aided by low construction productivity that ensures an apartment complex takes three years to complete, where the same in China takes under one year. Dramatic photos of dead malls can easily evoke emotions in the average American, who has been trained to think this sort of retail experience is normal. But charts that reveal the unique extent of US profligacy with regards to retail land reveals a much more logical sequence of impending events. As eCommerce continues to shutter brick and mortar retail, there will be a rising groundswell of pressure to repurpose this land for a more contemporary use. Unfortunately, the inadequate level of US construction productivity threatens to greatly delay this conversion, severely damaging our national competitiveness relative to China. On the subject of where the US may see China catch up, most of the focus is on Artificial Intelligence, Quantum Computing, and other high-concept technologies. Yet the construction productivity differential alone represents the single biggest sectoral deficit from the point of view of the US and many other countries. China is well-positioned to dominate the entire construction industry worldwide once it can more easily win international contracts and transplant its productivity practices abroad. If the US blocks Chinese construction imports, other countries across the world will happily partake in these high-quality end products. This should be welcomed by anyone with a free-market bent. For this reason, China's construction sector, in breaking the low-productivity pattern seen in almost the entire rest of the world, is the recipient of the February 2019 ATOM AotM. From the source documents it looks like the Chinese construction industry is benefiting from scale and standardization, but it doesn't show that it is more productive in a different environment, such as in the US, where there are cultural, regulatory and financial reasons that standardization has not become the norm. As developers main concerns are local politics/regulation and finance, this appears be in the area of what I will call "snap-backs" where at some time the benefits of technology will overwhelm the existing institutional structure, but not there yet. Health and education are similar areas - even medical tourism, which seems like a straight forward improvement hasn't taken off. I worked in the educational testing industry for a few years and the players are definitely looking over their shoulder for when someone re-invents the education industry, as well as trying to be that someone, but it still hasn't happened. Standardization, while not seen as a technology itself, certainly enables other technologies to emerge, since the addressable market for entrepreneurs becomes larger. China is seeking to build things in neighboring countries, under the Silk Road project. Those countries are usually poorer than China, and can standardize around China's methods easily. It is not just about how many square feet of indoor space you built per $, it is also about the quality of that space. Productivity may be falling off in the U.S., as it seems to have done in much of the western world, but the space is better lighted, better air conditioned, more fire and earthquake safe, and longer lasting. I can tell you, the construction quality in China is very poor. I thought about that, but then again, in the US we have Millennium Tower, in the wealthiest and most high-tech part of the US. I don't know of a major Chinese highrise collapsing. the artcile itslef says that the buildings are secure and even a bit overengineered in that regard. It is the finishing and fixtures that are of the lowest quality. I would say that this is exactly what I see in north America in the new residential buildings. The cheapest possible materials form a given class. A 300K house will use the same materials as 1.3M one . The latter will just have a better location and/or more rooms. On another note, there are some improvements in the construction/renovation. Drones can make inspection cheaper and easier. The battery power tools make the work faster and easier. One of the major hurdles is that gyps work is very manually intensive white the materials are dirt cheap. Probably a tool that can lay the compound to 1/32 “ precision will reduce the need for re-sanding and reapplying. Even if simple structures like parking garages could be pre-fabricated and assembled on-site in short order, the speed of urban improvement in the US would rise greatly. For example, in ultra-expensive Palo Alto, there are still open parking lots, where a multi-level garage would be better. Of course, my vision is that by 2032 we may not need nearly as many parking spaces at all, but that is a separate point. I've done work on home plumbing and electrical projects, and I'd say the biggest problem is standardization. It really is just miserable, ancient designs for things. new and better stuff is out there, but the industry as a whole is so conservative. Unions are the worst - why embrace any tool or technique that might cause your members to get fewer hours on the job? And there is something to be said for cost - I once had a contractor tell me the first thing he does when he gets a new home is replace all the switches, valves, and plugs. The standard stuff they use is such poor quality. Also somewhat off topic, but related to ATOM dues and a possible entry point for you to get your views more widely spread, is the current discussion of Modern Monetary Theory. This article is a contemporary view against it, but does have a wikipedia link about MMT in the article. The article itself displays the usual fallacy of treating a money creating government as the same as a family household, but also displays the worry that once if the government starts freely printing money, people will lose confidence in it. The more you can explain how the modern USA is more like modern Japan instead of modern Venezuela or Weimar Germany, the more successful you would likely be. I expect that we will continue to muddle through a version of this by running large deficits. If you are correct, interest rates will continue to be low and manageable, those who say that there will be a tipping point once increased debts cause a raise in interest rates, will be vindicated if there is a tipping point. I think you are more correct because of the technology deflation sponge that you have described, but don't think you will be able to convince people until they see widespread deflation that impacts them through lowered costs of protected sectors such as education/health/construction/government. but don't think you will be able to convince people until they see widespread deflation that impacts them through lowered costs of protected sectors such as education/health/construction/government. Education is already seeing massive cost-deflation, but since most people cannot separate that from the physical location of a school or university, they have trouble seeing it. Google and other employers have already said they don't need Bachelor's Degrees for highly qualified, proven candidates. Combine that with the glaringly conspicuous trend of highly-credentialed (and heavily indebted) graduates who truly know nothing, and the rubicon has already been crossed. Another problem is that too few people see that all technological disruptions are interconnected. That is why even the seemingly astute still believe government is untouchable, and that a C-Corp will cost $800/yr for registration for ever and ever. 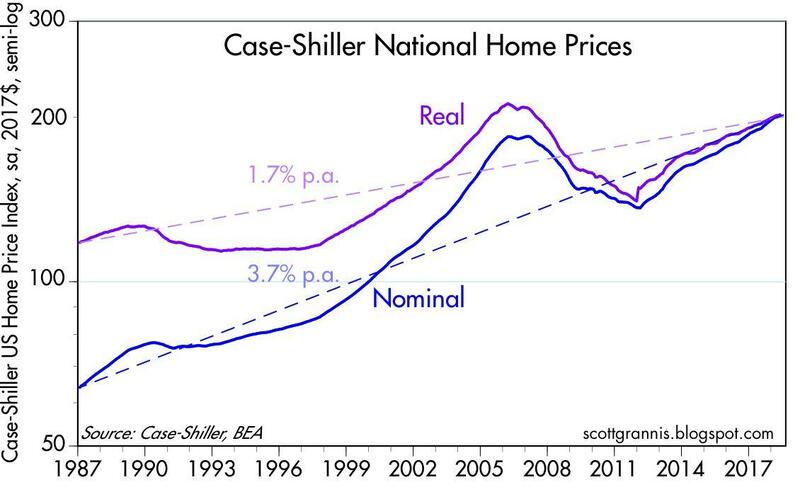 The main reason for housing price inflation, or perhaps the uncharacteristic lack of deflation, is mostly regulatory, not technological. Looking at some of the ever more rare less regulated (less land supply regulated) areas of the US, the average Silicon Valley worker can buy a house in e.g. Indianapolis, Atlanta, most of Texas and other unregulated fly-by country for a little more than a year's salary. In that respect there has been deflation. However that is not the case in "progressive" locales where the free market has broken down and individuals are forcibly conscripted to serve misguided communal goals, most often by average majoritarian rule which is, well, almost by definition, mediocre in its thinking. So in locales like Silicon Valley the main unaffordability issue is not that much the modest amount of space occupied by parking lots but the vast amount of space that is almost completely off limits to development as well as a mentality of essentially cordoning all development inside unexpandable city limits. Large areas of Santa Clara county have been regulated to one hundred and sixty acre (!) minimum lot subdivision sizes. Looking at Silicon Valley on Google Earth one sees that less than a third of available land is developed. In Silicon Valley you have suicidal phenomena whereby home owners are forced to pay additional levies on their taxes to finance the purchasing of undeveloped land so that it can be permanently placed out of circulation -- because that is what Silicon Valley residents voted for! In typical voter suicide fashion residents are financing their own housing unaffordability, their own working for an additional couple of decades just to finance their old crummy houses, even for those like myself who disagree. Renters? Well they don't own anything so they bury their head in the sand and think they are insulated from all this. Very few people benefit from this, primarily the smaller fraction of Silicon Valley residents who have no children and are one day soon going to sell their overpriced homes and move out of the area. For those who want to stay, their next house, the house they would really like to upgrade to, is becoming expensive at an even faster rate than their current residence. For those who have children, Silicon Valley residents are essentially pricing their offspring out of the area. Needless to say that all this also increases the risk that the distortionary bubble will burst leaving behind a once hip place, like Detroit. These phenomena are all much more pronounced and advanced in Europe where average housing prices for even smaller houses are even larger multiples of annual incomes compared to virtually all US cities. As in Europe, once this vicious cycle gets going it is impossible to reverse. People will react by attempting to drive away demand rather than vomit all the progressive policies they have believed in for decades and free supply, as they did in Long Island city. Politics is the reason that reversion to the mean exponential growth trendline happens unevenly. And in places that exhibit high levels of coercive collectivism most aspects of life are asphyxiatingly regulated and dictated by the majority. A majority which, almost by definition, represents the mediocre mind. Subordination of the competent to the mediocre largely determines whether a society falls behind, matches, or exceeds the mean world growth exponential trajectory. And, as I'm sure most people in these pages understand, small differences in exponent quickly compound to huge differences -- and this compounding will become ever faster as the exponential further accelerates. Hindsight will quickly become twenty-twenty but for those societies that make the wrong choices it will be too late -- way too late, and quite fast. One thing I point out around Silicon Valley is that no tech person would ever want to restrict the supply of the next great tech product (say, the iPhone 9) to just 1000 units in order to create artificial scarcity and keep unit prices high. But the same 'tech people' want to do exactly that with housing. SV has a pernicious combo of restrictions on new development, AND Prop 13 (which, while a State law, has had the most extreme impact in the Bay Area). This has created a very un-American situation of a landed gentry. People will react by attempting to drive away demand rather than vomit all the progressive policies they have believed in for decades and free supply, as they did in Long Island city. Yes. See AOC's gloating about driving away Amazon's HQ2 from NYC. One thing that has delayed Silicon Valley's long-overdue housing price correction is the fact that almost nowhere else has anything close to the 500,000 world-class tech professionals that SV has, which in turn keeps VC here, and VC by nature is very oligarchal..
Austin, San Diego, and even Seattle, all touted as the 'Next Silicon Valley' in the 1990s, have nothing close to that and are not longer considered to be competitors to Silicon Valley. Hence, these don't become alternative destinations for the same caliber of people. What may happen is that when China uses Maglev trains to link 2-3 large cities together such that you can get from one end to another in 30 minutes, they will create megacities of 50M+ people. While Chinese innovative capacity per capita will still be lower than in Silicon Valley, a city this size might still easily surpass the 500,000 number regarding world-class tech people, as the percentage of the populated needed to be above a certain threshold is much lower. This could be what spells the end of SV's monopoly, as the dollar volume of tech activity in such a megacity may greatly surpass SV. "And, as I'm sure most people in these pages understand, small differences in exponent quickly compound to huge differences -- and this compounding will become ever faster as the exponential further accelerates. Hindsight will quickly become twenty-twenty but for those societies that make the wrong choices it will be too late -- way too late, and quite fast." I'ts funny - Silicon valley has an inherent advantage over all other places because of this exponential growth, and attracting VC funding. At the same time, silicon valley is busy destroying itself because it won't allow additional residents in. One or the other must win. What keeps it going is the fact that highly skilled immigrants who don't realize they are being ripped off keep coming to SV. Very few countries in the world can attract highly skilled immigrants. Of these countries, a few cities get a disproportionate share of them. At the very top of the ladder is Silicon Valley. A large portion of the people in SV earning $300K or more are immigrants. When you think about it, that is astonishing, since only ~5% of domestic Americans earn that much. But here you have people from abroad comprising a huge portion (even a majority) of people earning that much. As immigrants, they have a dozen other things on their mind in terms of adjusting to a new country, and it takes them 20 years to figure out that they are overpaying for housing and are overtaxed. Hence, this extreme distortion continues as an unlimited supply of Chinese and Indians who can earn $300K+ comes here. Isn't anyone who goes to the one of leading global cities to make a leading salary overpaying for housing? Or, the price of housing is bid up to reflect the opportunity? London, Manhattan, Singapore? If construction is allowed to keep up with market demand, then a person is not necessarily overpaying. Where construction is restricted, the price spiral gets out of control, and the percentage of people who make enough to buy a new house shrinks. "A large portion of the people in SV earning $300K or more are immigrants". "unlimited supply of Chinese and Indians who can earn $300K+ comes here." I haven't commented on your blog for a while, after the disparaging and belittling comments you made of my last comments, despite the fact that I am a fan. But something needs to be said here. As a second generation Immigrant I am going to call out your misleading comment from above. Most of my family is in medicine and they do tend to make above 300K as you mention it. But they have been here for decades and constitute a very small minority of the immigrant community. Less than 1% of the immigrant community that I know of is making anywhere close to 300K. Matter of fact the overwhelming majority makes in the neighborhood of 75-80k if that. AND YES, I do mean the bay area. This is because of the massive HIB, L1 and BI visa fraud that is so rampant in the U.S and excessively rampant in SV. There is a reason congressmen from your state proposed to increase the HIB wage to 130,000.00. Which by the way hasn't passed yet and would still not be enough. So I am curious to know who are these immigrants that make 300k. Anyone and everyone who works in IT knows the truth, which is the rampant fraud that exists in IT via the H1B, L1, and B1 visa. As an immigrant of Indian ethnicity, I am ashamed to say that. But someone has to call that out. The regular commenters on your blog should know this. And should have called you out on this, but they probably don't want to be accused of racism, even though what is happening in IT now is reverse racism. My white friends have moved out of IT and are discouraging their kids from moving into IT. Against such background, where the only claim to fame of the current wave of migrants from India (say 2000 onwards) seems to be labor arbitrage, which is to say they will work for peanuts (maddeningly because there seems to be better jobs in their home country of India, now). I am curious to know which one of these make 300k and above. Most of what Amazon and google of the world seem to offer is a horrible base of mid 100's with stock options that don't really materialize till the 4th year. Which, if you happen to work for google or amazon (maybe not facebook) you are more then likely to be forced out at. The community you seem to mention that makes 300k or more, is tiny. The overwhelming majority of the immigrant community like I said makes a fraction of that and lives 6 to an apartment (obviously not all of them). Professor Ron Hira of Howard College has repeatedly mentioned this backed by facts and studies. Do please feel free to google him. And what this living 6 to an apartment does, is it further suppresses wages. If not for the rampant abuse in the H1B, L1 and B1 visa system primarily by Indian immigrants. The wages in IT would have been 300k for not just the .1% in CA but nationwide. So again, I am a fan but I am calling a spade a spade. Your comment/claim is misleading and the regulars on this blog know this. Please continue to keep you blog focused on disruption that you usually do and that is why you have die hard fans. It is when you go off on a tangent like this that you lose some of us. I am sure you will again say something nasty, disparaging or belittle my comment again. To which all I can say is it is your blog do what you may. You said that the Fed 'will never allow even a 5% correction' (when a much deeper correction did in fact happen in December 2018), and then kept using AMZN as the sole indicator of economic health. If correcting that is 'belittling and disparaging', that is your problem. But they have been here for decades and constitute a very small minority of the immigrant community. Less than 1% of the immigrant community that I know of is making anywhere close to 300K. You have made a very basic mistake here. I said that in Silicon Valley, a large portion of the people making above $300K are immigrants. You got it upside down, wrongly claiming that I said 'most immigrants make over $300K'. Just because all crocodiles are reptiles, that does not mean all reptiles are crocodiles. Lastly, H1-Bs are only a small fraction of immigrants. The VCs and senior execs (many of whom are immigrants) are not H1-Bs. Check the Forbes 100 list of VCs. No one stays on H1-B status beyond the first few years. Also note that not all immigrants are Indians. Many of the white VCs and Senior Execs in SV are immigrant whites too. The rest of your comment is virtually unreadable (a page-length paragraph), and continues on the premise of the basic reading comprehension error you made above. Now, if you think this is 'nasty and disparaging', which conveniently means that no one can correct your errors even if they are polite, then this may not be the right comments section for you. Like I said, disparaging and belittling. Ok won't comment anymore and won't comeback to this blog. If you have to fudge facts to get your points across, then there is no point commenting on being this blog. By the way the only real VC who happens to be Indian is Vinod Khosla. The fact that over 85 percent of the H1b, L1 and B1 visa's go to Indian immigrants should tell you something. Call a spade a spade. This is the primary reason wages in IT haven't gone anywhere and that is why your argument about immigrants making over 300k remains bunk. Funny how facts and mention of Professor Ron Hira is considered virtually unreadable. Falsehood #1 : Vinod Khosla is the only Indian VC. Falsehood #2 : All immigrants come from just one country : India. Again, I find it astonishing that I have to point out that India is not the only country that immigrants to Silicon Valley come from, and that the Indians who are VCs earning millions are not on some H1-B visa. Lastly, the rather comical error you continue to make is the inability to grasp that my statement of "a large number of $300K earners in SV are immigrants" is not the same thing as saying "all immigrants earn $300K" which they obviously do not, but you are railing against something I did not say or even imply. My statement, which is : "A large portion of the people in SV earning $300K or more are immigrants. " still stands. You have not refuted this in any way. Correcting some rather absurd errors on your part is not 'fudging facts'; this too as said by someone so keen on factual accuracy that he asserts that the only Indian who is a real VC is Vinod Khosla (when it takes five seconds to pull up the Forbes 100 VC list). There is no way to say it without you getting offended, but your reading comprehension is consistently very poor. A person says 'X', and you start railing against 'Y', that too with incorrect info as pertains to 'Y'. I can confirm that a major portion of the $300K earning elite in Silicon Valley are immigrants. Anyone who knows anything about Silicon Valley sees this every day. I actually thought the Midas list you linked would have more than 40 immigrants on it. This 'Sunny' person seems to be arguing about something unrelated, apparently a figment of his own imagination. I highly doubt that Sunny is 'second generation' (i.e. born in the US) as he claims, as his comment has the two tell-tale signs of a FoB Indian from a mid-tier background in India, which are Indian-style grammatical errors, and an argumentative personality that lacks any self-awareness. I occasionally contribute here, or exchange ideas, because I do believe that this blog can stand to be more practical and less "true believer" when it comes to the positions it takes. Others can see what I mean by my posts in the medical innovation/AI blog entry, which exposes a lot of this AI stuff as sensationalism. As I report there, this does not mean that I suggest that technological efficiency is receding, quite the contrary. But folks here tend to not only overstate it, they can't seem to admit it when we do have evidence that certain claims have been made before, clearly didn't go anywhere, and don't result in better outcomes even if they technically exist as a marketing technological "innovation" (see computer aided detection in mammography, among countless other health care examples). As a result, I weigh in at times to keep you all at an even keel. I find a lot of your ideas fascinating, but I'm unconvinced about the central banking issues --- since the Ramy article was older I decided to post here --- especially using Japan as a shining example. Japan HAS to have an export economy (look at its demographics, that's why it had to QE to oblivion too), they are not investing as much because of scares from the last market bubble crash/crush (ask Dr. Koo), but as Koo knows, NO ONE knows how to unwind QE to this degree at this point, it's never been tried. We need some honesty here. Sorta like the honesty when I asked you about a recession in the USA, Kartik, and you said late 2017 that it was about to arrive (Vix, etc). I love predictions, so I can't give you that hard of a time, especially when it's a very difficult prediction, as are most of yours, some of which you clearly deserve credit for. But using Japan as an example for US suggested behavior is a grave mistake. There is NO bond market in Japan. You don't think the Nikkei is going to tumble down again in the future? Then what do they do? Be careful about what you don't know (how to handle these challenges in the future) when you suggest to take Japan's path. It's at best ignorant, at worst, extreme negligence or even, hubris. By the way, most central banks are doing versions of Japan, and for other reasons, the US is more likely to be the last man standing after all of this manipulation. Socially is where its decay is worse, however --- a place where I wish you materialists would focus on more and more. Us "rich" people have less to worry about in terms of future standard of living than we do bequeathing a repulsive, anti-human culture to our kids, if we even have them. Palamas my friend, you are flattering yourself a bit. I argued with you most strenuously on the medical issue, and I readily agree that medical advancements have been delayed, and have been disappointing in many ways. So I'm not clear how you think "I can't seem to admit it." I just admitted it, as I have several times before. You argument is basically, "they have made claims about advancing medical science using AI and it didn't work, so all future claims are suspect." That's not actually a logical viewpoint, and denies the potential that this time, things might actually turn out differently. Certainly Moore's law alone would suggested each subsequent attempt would have a higher likelihood of success. It is also hard to argue that success isn't inevitable, and we are really arguing about the date when it will occur. In such an argument no one is really right or wrong, since we all agree on the outcome. "NO ONE knows how to unwind QE to this degree at this point, it's never been tried." I'm not on board with QE forever, but...why do you have to unwind it? You're right, we are in uncharted waters, but that is also true for a great many economic issues. I think there are rapids ahead, and a great many adjustments in our thinking are going to be necessary. I don't know how to navigate it. No one really does. I think Kartik presents a compelling way of viewing the problem. Ultimately economies are all confidence games. We exchange little pieces of paper for stuff, and once we lose confidence the economy collapses. It's all rather silly, but I can't think of a better system. "Socially is where its decay is worse, however --- a place where I wish you materialists would focus on more and more. Us "rich" people have less to worry about in terms of future standard of living than we do bequeathing a repulsive, anti-human culture to our kids, if we even have them." Not the slightest idea what you are referring to here. I have three wonderful kids all doing their part to make a wonderful world. All I can say is I did my bit to make the world better in that regard. I don't consider myself a "materialist" at all, and happily make do with much less than I could have given my income. I annually save around 15% of my total income. I mostly do my own home and car repairs, and make furniture as a hobby. I spend a large amount of my time devoted to charity, specifically cutting electrical usage for churches and other public buildings by installing LED lighting in my free time. I frequently pay for the upgrades out of my own pocket, or raise money though a few wealthy friends. It's fun. I'm currently working with an Eagle Scout on just such a project. I find hands on charity work much more gratifying than moralizing about the defects of others. Japan is not an example of an ideal society. It is merely proof that the level to which monetary easing can be done without inflation is MUCH higher than most economists think. Japan has done 30% of its GDP in effective QE for 6 years running now, and still does not have any inflation. Part of this is because Japan's easing is being consumed by the US, in order to offset US tightening. False. It is being unwound, in exactly the reverse of the way it was generated in the first place. Much more important is the fact that it should NOT be unwound in the first place, and it should in fact be continued and expanded (into a cash-disbursement form, as described in the publication). Kartik is right - the Fed has been unwinding QE since 2017, and plans to complete the project by 2024. I think the rate of the unwind is around $30-50 billion a month. By December 2018 they had unwound almost $400 billion. They are doing it by just letting bonds mature and not buying any new bonds. So we know how to do this. Whether it is wise, or at what rate, that I don't know. But doing it is actually quite simple. They are in fact doing two tightenings - they have raised the Fed Funds rate from 0% to 2.5% (already wrong, given the flattish yield curve), *and* they are tightening to the tune of about $50B/month. This would have caused a recession by now if not for China and Japan increasing their own liquidity action to offset. But yes, unwinding is technically simple. When the crisis eventually arises, the same type of QE won't be as effective as they only operated in Treasuries and MBSs. This doesn't help the other 85% of the population much. what do you think of the next recession? Now almost every majore investment bank are advising bracing for impact and preparing for recession. Do you think it is close ? Good question. Let us chart the chronology. In the ATOM publication (published in Feb 2016), I said that the peak would be in 2017, but that peak to trough can take up to 30 months (2000-02 was 30 months, 2007-09 was 18 months). The market did in fact top on Jan 26, 2018, which I called out on my LinkedIn. So my call was just 26 days after 2017. BUT, the surprise victory of Trump, and subsequent tax and regulatory reform, removed the dampening effect priced in from the Obama-Hillary presence and expectation respectively. People forgot that when Obama pulled ahead in 2008, everything dipped an extra 20%, and the exact reverse happened when Trump won, reminding us where the trendline really is. The trajectory we were on as of early 2008 was restored by the Trump rally of 2017. Meanwhile, the Federal Reserve is still tightening against all logic and evidence. This pushed us to the edge of the cliff in December 2018, until Trump pressured the Fed to not force a recession needlessly. It is wrong for a President to pressure the Fed, but in this case, Trump was factually correct, and the Fed, with all their hundreds of PhDs, was behaving in violation of any Econ 101 textbook. But as the status quo of a high Fed Fund rate and balance sheet unwinding continues, this could still push us into recession. To the extent that China prints more and more, this keeps us out of it. So to answer your question, there continues to be small spurts of positive action that offset the recession-inducing ivory tower Fed juggernaut. When the stimulants run out, a recession happens. But the bottom could take up to 30 months from Jan 26, 2018 (we are currently a little over 13 months past that date). In addition, the removal of the Obama-Hillary assumption and the reminder of where the trendline really is, means a recession need not be as deep as initially expected. 1) The end of at least slow down of the quantitative tightening by the fed. Stable or lower interest rates. 2) A really "good" deal with China on trade. This would be in China's best interest as well, but lately they have lost sight of the ball. 3) Drop in oil prices. Say to $25/barrel. The driver could be reduced demand coupled with increased supply from a reformed Venezuela, pumping like mad. 4) Apparent continuation of Trump in office past 2020. That would include a cessation of impeachment efforts. Recessions are a little like predicting floods. You can guess when the water gets high by the weather, but it is hard to know when the levees will actually fail. Sometimes the storm will pass without the levee being topped. Sometimes sand bags make a difference. Sometimes nothing does. What worries me is that now a lot of investment banks prepare for recession and the do it in clear text. For some the last recession is not over yet, so I would hope that the financial system is more robust and stable, as the memories of liehman brothers are still fresh.. It could be. The Friday jobs report was very weak, and while one month of weak data does not indicate a trend, it is definitely worse than having a strong report in the midst of other weakening internals. The bigger risk is that since the Fed is lightyears away from grasping ATOM concepts, they will have to undo three missteps (halting QE, unwinding QE, and raising rates) just to undo the damage. After that, QE of the same type as before will not help like before, due to reasons explained in the ATOM publication. On the topic of Silicon Valley real estate, is it more that the locals decided they didn't want to build more, and that the wave of high-income immigrants came later, and the locals are happy to profit from their labor? Or is it that the sheer volume of $300K-earning immigrants turned out to be much higher than anyone anticipated? Won't the tech industry just leak out of the Bay Area, either to lower-cost locations in the States, or (more likely) to Asia? I actually tried to look up Ron Hira, which that 'Sunny' moron above mentioned. He actually is at Howard University, not 'Howard College' (Sunny can't even get that rather important detail right). Ron Hira's work is in an entirely unrelated area to this discussion. I think it is more simple-minded. They just like that their houses kept going up, and never want to adjust downward, even if that means falling back down to mere 2012 prices. Given that the immigrants can't really figure out all this until they have been here for years, you get the situation we have here, where a sizeable percentage of the upper-class are immigrants, even if those immigrants are buying houses at much higher prices than the locals in the same neighborhood bought them for 20-40 years prior. Apparently they (SV residents) also like their next house -- the one they aspire to one day move into -- to become more expensive, at an even higher absolute dollar rate than their current house, and also apparently like to price their offspring out of the area. I think that an enviro-NIMBY coalition juggernaut, coupled with local planning officials which are always willing to increase their importance and power by becoming gateways to housing supply regulation, has developed in SV and other "progressive" locales. This SV housing supply restriction will self feed in a destructive positive feedback loop until the bubble bursts leaving behind a once vibrant area, like many cities of the past which we hardly even remember. Except that as the singularity approaches-- or just as our current unprecedented world growth era continues for that matter -- all cycles shorten. Ascents and declines, whether local, national, cultural or civilizational, which once unfolded over centuries will now conclude in a few decades. For example, in SV, a major earthquake, now geologically due for some time, which may easily force many major businesses to close (damaged buildings) even for a few months, could prick the bubble and housing prices may collapse. In typical rejection of the true underlying cause, people will blame the earthquake (the needle that pricked the bubble) for the failure -- rather than the underlying cause, the decades of enviro-NIMBY attitude inflating the vulnerable gigantic housing bubble in the first place. Or using Geoman's excellent analogy of floods, people will blame the flood on the one sandbag that happened to give way first. If the water of increasing house prices has no supply-side outlet then sooner or later the water will overcome the levee. As a matter of fact, without a water outlet, the more sandbags you pack the worse the eventual flood. Nobody in their right mind would buy a house in SV -- unless they expected significant appreciation-- as also evidenced by the dismal rent to purchase price ratios in the area. However, continued appreciation means that SV counts on an ever increasing housing price multiple compared to the rest of the country. This cannot go on forever. No matter how many sandbags are put in place somewhere the levee will fail since there is no housing supply outlet -- or at least supply of housing people really want to live in. Building European style apartment beehives by the railroad tracks is a sandbag. After a few years in SV, those immigrants will eventually want some bigger reward for having surpassed incredible odds and obstacles, and for having made career choices that place them in the world's top half percent in terms of competence. The question is - when does the SV perversion correct? Many thought 2007 was the top, but the weird, concentrated way that QE was done boosted Palo Alto to levels that are over twice the 2007 top, even as Phoenix, Las Vegas, and Sacramento are still below 2007 levels. The tax reform to cap SALT deduction at $10,000 helps normalize things, but is probably not enough given that most of the intended targets were paying more through AMT anyway. The shortening cycles should affect this. Yet, I continue to believe that the only population cluster that can outcompete SV in the near term is a Chinese mega-city, which can't beat SV in per-capita talent but can crush it in absolute number of tech participants. at an even higher absolute dollar rate than their current house, and also apparently like to price their offspring out of the area. One correction - Prop 13 benefits pass on to subsequent generations, so many children will inherit houses that they could never buy on their own, and maintain low property tax. They will pay $1000/yr in tax even as their next-door neighbor pays $10,000/yr. Prop 13 is statewide, of course, but the other factors in SV lead to a vicious cycle that makes Prop 13 in the Bay Area far worse than even in Los Angeles. When things become status symbols, it becomes really hard to properly value them. Having a high rise condo in New York, and a house in SV, has become a status symbol. It shows you've made it. Who cares how overvalued it is? Luis Vittan bags, rare postage stamps, and Koenigsegg One:1 cars are overvalued, that doesn't stop them from being purchased. All have alternatives, very good alternatives, that are orders of magnitude cheaper. It doesn't matter. That is my concern - that real estate in SV has passed into the luxury accessory market. By the way, I was born in San Jose, and the house I lived in recently sold for $1.2 million. It was a tiny shack my father probably bought for $15k on the GI bill in 1965. Heck, my parents second home, they bought for $236,000 in the early 1990s and sold for $750,000 in the late 2005, pocketing the difference and moving to Arizona, paying $250,000 cash for a beautiful home. I think, at this point, all the cash outs of real estate in SV have probably occurred, and the current price is unlikely to change. I don't think the cashouts are over. One way to check is if the recent home sales of $1M+ homes (preferably $2M+) comprise of many units that had not been sold in the prior 15 years. If we can find that a decent percentage of recent sales were from owners who occupied the place for 15+ years, that means cash-outs are still underway. SV has thus far benefited from a number of global megatrends that have disproportionately concentrated there (both the ATOM and the small number of highly skilled immigrants in the world). But a countertrend can arrive just as quickly, as HB pointed out. Since SV housing is directly in opposition to the ATOM, it could crack in much the same way as OPEC and NY Taxi Medallions (both of which thought their position was unassailable, but were decimated within 36 months from the start of the respective technological disruption). Another major fact is that tech billionaires are being exposed as savant-like and megalomaniacal, and have in fact devalued the prestige of extreme wealth itself. This greatly prevents SV from gaining the level of prestige that any famous SoCal location might have. The pattern of tech billionaires marrying very average-looking women has not gone unnoticed, and has become a cultural cliche of its own. The dominant cultural zeitgeist in America (feminism) utterly hates tech billionaires (for reasons described in The Misandry Bubble), despite tech billionaires' basic inclination to grovel to feminists (indeed, because of it). The fact that tech billionaires are politically unsophisticated and think they have the right to decide what is news and who wins elections has damaged their reputation with middle America as well, who until 2009 or so (pre-social media) assumed the tech industry was apolitical. So Silicon Valley housing, in and of itself, will never become as prestigious as housing in Beverly Hills (which ironically is cheaper). Stanford as an institution is a different matter. Heh. They should have taken out $250K in equity, and kept the home, given that Prop 13 lock that would still be in effect (and passed on to you or their other children/grandchildren). Rent net of existing mortgage payments and property taxes would easily by $1500+/month today, free and clear. Yes, status symbols and prop 13 may be contributing but the main reason for SV housing bubble inflation is regulatory. In my view, the pivotal legislative change that made this possible happened subtly some decades ago (1970s) when California mandated the creation of regional planning powers (region-wide urban boundaries and such) enabling housing supply restrictions under the appealing name of "smart-growth", a marketing name for a host of housing supply restrictions which in reality is a pretty dumb suicidal move that voter-lemmings seem to easily embrace the world over. So now due to the regional planning committee powers the residents of Silicon Valley cannot only block new development in their own cities but, more importantly, can block the creation of even new cities in their entire commutable region, plus also block housing supply increases in neighboring cities. Were it not for that, some cities would see opportunity and break ranks and increase housing supply, or entire new cities would spring up nearby to be quickly populated by new residents from the rest of the country/world and professionals escaping SV housing prices. Businesses would then follow the migrating and expanding talent. But all this can -- and is-- blocked by the expanded California regional housing powers which have been populated by an enviro-NIMBY coalition, with many voters openly approving and even more voters silently consenting, as in the case of busy immigrants. For example, one of the potent repressive housing supply restriction tools of "smart growth" is the ability of any minority to block developments that would benefit large majorities. A small five person minority group of "native" established stay at home housewives, who lucked out and bought their SV houses in the seventies, who realize they got a good deal and want to freeze their good luck in time, who spend their ample idle time picking invasive weeds on some SV hillside, can go to city hall and block an entire housing project for two hundred or more immigrants or out of Valley Americans with thousands of times the productive modern world capacity compared to the five housewives. And, as Kartik points out, the two hundred immigrants and their families are too humble in their new environment and primarily too busy to go down to a city hall where the voice of the housing project blocker (by legislative design) has many times the power of the housing project promoter in the fist place. Also the five housewives have an immediate (short sighted in this case indeed) stake in blocking the project, while the immigrants' increased housing supply benefit (from the specific project) is much more vague and diluted -- yet just as real. A typical similar aspect of these dynamics can be seen at the beginning of the development cycle. Farmer Bob, farmer Jay, farmer Ben, and farmer Don each own one hundred acre farms. Farmer Ben subdivides his land and sells it for housing, initially affordable. Five years later two hundred families move in the area. Five years later the residents create a "Save the Bob Jay and Don hillside coalition" and under California's *mandated* regional planning can -- and will -- block development on Bob's Jay's and Don's land who, after all, have become a small powerless minority against the holly enviro-nimby alliance of new residents. Suicidal policy aside, one should also not overlook the fact that Bob's, Jay's and Don's land is de-facto in large part confiscated by a majority who does not want the three remaining farmers to do to their land what was done to build the very housing where the current newly established majority just started living in. Such theft is (or perhaps should according to some views) be protected from democracy by the constitution, but apparently, in practice it is not. Indeed, the main function of a constitution in a democracy is a rather broad contract to not screw each other when we get the majoritarian opportunity. At least that is in the American constitution. Without it the feeling that "some day, in some way, they will come for you too" breaks down societal trust, and the country becomes the basket case nation that is the rule in most of the world where developed nations are the exception -- and developed nations that at least match average world growth (i.e. they are not in decline) are an even rarer exception. Also, not coincidentally, our newly formed one hundred California households and the regional powers granted to them by the legislature can block an even bigger majority of, say, three hundred new very competent households from moving into their area from the Midwest or the rest of the world, thereby blocking the even bigger potential newcomer majority before they even get the chance to vote. So Silicon Valley residents will continue their agonizing commutes from their cubicles to their crummy houses, during which long commutes they will dream of making another half million dollars at their cubicle (that is one million before taxes and deductions) so they can add another bedroom and bath to their old house. Now, mind you, these are supposed to be some of the select smartest people in the nation/world! As is often typical, the roots of a region's decline are inconspicuously established in the success phase of the cycle, when they are hardly noticed. But predicting when exactly the decline starts is virtually impossible for everybody, except perhaps a few very enlightened and also perhaps lucky very intelligent people. Until then the fear of missing out keeps pushing most of us towards inflating the bubble and the eventual destruction of the very area we like. Kartik mentions in his opening statement how odd it is that the technology industry has so little awareness of this. Indeed the general behavior of the electorate on this issue is completely irrational -- and suicidal. Talking about shooting yourself in the wallet. Geoman's comment about his parents illustrates in many ways the case of those offspring that are priced out of the SV area -- and its potential opportunity -- which over a lifetime might have been many times over the parents' house cash out, especially in households with more than one child. This blocked migration, in turn, imparts an even larger missed opportunity on the rest of the world who would greatly benefit from the foregone increased innovation, and thus an even faster ATOM. That was an epic comment. Perhaps one the best ever posted here. So now due to the regional planning committee powers the residents of Silicon Valley cannot only block new development in their own cities but, more importantly, can block the creation of even new cities in their entire commutable region, plus also block housing supply increases in neighboring cities. This is the worst part. For years I wondered why just one incensed city in the East Bay, where little to no tech money was percolating, could not just break rank and decide to go big and build 50,000 apartments in the form of a dense but fun village, demolishing the housing prices of peninsula cities and attracting employers to that location. This is why, and it is impossible for most locals to understand. Even in Los Angeles, the problem is only 20% as severe, which in turn mutes the compounding effect of Prop 13, largely because the larger size of the metro makes it harder for this sort of oligarchy to truly form. Now, mind you, these are supposed to be some of the select smartest people in the nation/world! The educational systems of Asian countries and Russia create narrowly specialized people who are brilliant in their professional area (circuit design, Java programming, etc. ), but largely uninformed and incurious in virtually any other area. This contributes to the problem you mentioned, where 1000 tech worker families don't organize to overpower the five aged housewives. This problem is compounded by the fact that once such a family takes on debt to buy a wooden box, they suddenly become just as opposed to new construction, effectively becoming useful idiots for the cause of the five housewives. Remember my earlier point, about how while no tech worker would ever want to restrict the supply of iPhone 9s to increase price per unit through artificial scarcity, they are more than willing to do exactly that with Bay Area housing. This reveals that their understanding of, and commitment to, technology is far weaker than they imagine it to be. But at some point, it breaks, even if it held out longer than anyone thought it could. The two most analogous oligarchies of recent times - OPEC and the Taxi Medallion cartel - seemed just as unbreakable as this, only to eventually cascade into impotence within just 36 months of the start of the new disruption. Something analogous could happen here, someday. As powerful and entrenched as the Bay Area housing despots are, they are much less powerful than OPEC was. There are at least 3 technologies working against Bay Area housing : self-driving cars, mass-market gigabit Internet, and corporate-class VR. While Hyperloop will not be built in CA (another aspect of CA's dysfunction), it might make a competing area more viable, which punctures the SV bubble. The recent tax reform that capped the SALT deduction at $10,000 was a step in the right direction. Very few people in entire states like Ohio, Pennsylvania, etc. would see any effect from that cap (while Texas, Florida, etc. pay zero already), but many SV workers will feel the hit. (1) An old joke - what's the difference between a preservationist and a developer? The preservationist built his cabin last year and the developer is building his cabin next year. (2) If all those high value workers were competent enough at self-organization to overcome the constraints of the SV property environment, they would be competent enough at self-organization that they wouldn't need to move to SV to prosper. So I agree that it will be some version of technology that improves organization that will prevent the funneling of more workers into SV. OPEC and NY Taxi Medallions. You make a good point - if those can be shattered by the the ATOM, what can't be? Didn't some crazy billionaire have a plant to building housing offshore on barges from SF? Whatever happened with that? Didn't some crazy billionaire have a plant to building housing offshore on barges from SF? That was called 'Blueseed', which was nothing more than a .ppt deck angling for funding, and went defunct. Seasteading is a good idea in theory, but for tax-avoidance reasons, not because there is any shortage of land. A ship with P.O boxes as a tax haven is the best application of Seasteading. That is what has to happen. As Drew points out, tech people can't organize. Even employers should join this organizational campaign, since they have to pay more and more to their employees entirely due to housing costs. An employer with 10,000 local employees might be paying an extra $500M/year in compensation in excess of what they might if there were more housing. Note that this also increases the pressure to speed up automation of human jobs, under ATOM principles. Anecdotally, another trend seems to be starting. I have often wondered why non-tech people even live in SV. But I am now hearing that many types of medical procedures at Kaiser have 6-week waitlists in SV, while one can go to Sacramento to get it done with an appointment just 10 days in the future. If HMO-employed doctors find the Bay Area unattractive (since their pay is the same elsewhere, and they are entirely independent of the sectoral composition of the local economy) and the supply/demand situation is unfavorable for patients, then that is yet another factor that an organizer could use to muscle out the five housewives. In addition, Gov. Gavin Newsome at least said exactly the right thing. He said that cities that don't build enough housing supply will see state funding discontinued (almost all such CA cities are in the Western half of the Bay Area). Whether he intends to follow through on that threat remains to be seen, but that is exactly the right type of threat to make. Gavin Newsome is trying to force the surrounding communities to be come bedrooms for SF. Which is funny because SF was the originator of all this nonsense. The obvious solution? Google, Adobe, Apple, HP, facebook, and the other tech giants build housing for their employees on their corporate campuses. Instead of offering higher pay, they could offer a very comfortable condos at a fraction of the market price. I imagine it would prove quite the perk - no commuting, low rent, better amenities, etc. Build it over top the existing parking lots. Apple has 23,000 employees - You could house several thousand on the campus itself. And you would make the case that you are reducing congestion while growing the economy. What could the five housewives do to stop that? And part of your rent goes to equity - if you leave the company, you get a refund of that equity. Say 2 bedrooms, $1,500 a month with $100 toward equity. That would be less than half the cost of a local apartment. Apple could decide that the investment would be revenue neutral - merely exist as an attractant to top talent. I imagine the foreign born would love just such a set up. The one thing the ATOM does is make the implicit, explicit. That is to say taxis - they were grossly overpriced due to medallion costs through the roof, which acted like a government tax on passengers. But no one really knew that was why taxis cost what they cost. It was implicit. Uber blew that apart - suddenly the actual cost structure for taxis became more apparent to consumers, and they questioned what they hell they were actually paying for. same thing with OPEC. What value did they actually bring to any consumer? The obvious solution? Google, Adobe, Apple, HP, facebook, and the other tech giants build housing for their employees on their corporate campuses. The zoning laws in SV cities completely prohibit this sort of housing supply increase on commercial land zoned for offices. Even Google would dare not incur the wrath of the mighty Mountain View City Council by trying to do this. Even if young tech workers had a cot in the corner, and just lived on-site, that would lead to heavy fines for the tech company if discovered. What is amazing to me is how trillion-dollar market cap companies like Google and Apple have so little power relative to the city councils of 80,000-person towns like Mountain View, Cupertino, etc. Google can influence elections in the biggest democracies (and openly feels entitled to do so), but can't get its way with the City Councils of Mountain View and Sunnyvale. By contrast, mid-level mafia Caporegimes could probably armtwist the City Council yentas into acquiescence with ease. I bet if they saw how little power these trillion-dollar entities have in relation to their local councils, they would laugh. Perhaps what SV needs is an element of organized crime that profits from construction. Even after their cut of each project, there is an immense net savings to society through increased housing supply. I suspect this has a strong correlation with why most tech billionaires have very average-looking wives and girlfriends (even if they started their relationships after the man was already a famous billionaire). There are a number of skills, attributes, and awarenesses that money just can't buy. This pattern is worthy of further examination. Both OPEC and Taxi Medallions behaved in exactly the same way as the Bay Area housing despots. The US university sector is another example of an oligarchy that is charging more and more for a product of dwindling quality. It seems unbreakable today, but it could break in a very OPEC-style way (as discussed in other articles). You have a point on zoning, but I think a case could be made. Focus on preserving open space, reducing commuting, global warming, blah blah. Worth a try. Rally the greens to your side, tell everyone this is exactly what they have always wanted. Offer to add some park land. Point out the additional property taxes. It could work. Some of these old ladies might be tired of single family houses with garages full of computers, and six guys bunking. Universities - ugh. The most progressive bastions of thought treat everyone worse than even the most rapacious corporations. Forget tuition, forget the B.S. of the admissions process, which is manifestly not fair and often racist, just look at how they treat free speech, how they treat their own graduate students, who act as Helots to the Spartan kings. I recall in graduate school, 30 years ago, seriously discussing forming a union just because we were treated so dismally - long hours, crap pay, no benefits. I never worked for a corporation where I was treated as half as badly as I was as a non tenured instructor at a state college. With the and benefit of getting lectured on how tight budgets were by administrators in oak-lined offices making $250k a year and providing zero educational value. From what I hear, nothing has changed. Oh, I am certain that it is much worse now. Look at what comes in the news about Universities. Interestingly, the administrative bureaucrats of universities seem to be people who could most easily be automated by AI, particularly since the job is exactly the same at every single university. A university could be seduced into saving a huge portion of its budget just by jettisoning all these administrators and replacing that with AI. A lot of college graduates with useless fluffy degrees have no other employment avenue other than the university itself. But the amount of money that a university can save is still high. Whether the university passes the savings on to students or (most likely) not, it is still a savings that should be implemented immediately. About 98% of the US land surface is open space. Not because someone "saved" it from "greed" but because there are simply not enough people to fill it. Apparently that dropping to 97%, or heavens forbid 96% will be a major ecological catastrophe -- one worth working fifteen extra years of your life, one worth upending societal trust in that "anything goes and your land can be de-facto nationalized at any time" -- to sustain extreme cost inflation on the housing commodity. In fact, it's even pettier than that; much pettier. All the enviro-nimby constrained areas of the US represent no more than around 0.15% of the US land surface. Therefore, even a complete doubling of the built up footprint in those areas would, oh heavens forbid, reduce US open space from around 98% to 97.85% of the land mass. Oh my, how might we deal with such catastrophe! Few things seem more irrational from a helicopter view. Even the few most densely populated countries in the world (themselves representing less than a tenth of the earth's surface) have upwards of 80-90% of their land surface as open space. Our planet is a heck of a lot less populated than most people think. In spite of the dominant Malthusian attitudes, human life on this planet is actually so sparse that it can hardly be seen from space, even from low orbit. The very creation of cities like Las Vegas means that humans are already technologically capable of living pretty much anywhere. Yet, a minute proportion of that space is utilized, or can possibly be utilized anyway, simply because there just aren't enough humans on earth to do so. Of course if you live in a four hundred square foot apartment on the sixth floor of a tower block in Paris, been ferried as a sheep in mass transportation to and from your cubicle day in day out, the world looks pretty crowded. But that is to a large extent a result of handing over your future to city planners and capitulating to the enviro-nimby juggernaut, which at its core is resentful of capitalism and the very ideas that form the core of the ATOM. But in the end, who is going to win? The enviro-nimby juggernaut or the cosmic force of the ATOM ? Will history remember the Silicon Valley serfs working an extra fifteen years of their still short lives to support hyperinflated commodity prices on wooden boxes? While currently significant contributors to the ATOM, in the end, they will turn out to be self aggrandizing snails in the path of a steamroller, feeling strong and confident in their hard shells. In retrospect they will have been useful idiots who wasted fifteen years of their still short lives to support inflated housing prices and the enviro-nimby idols. An utter waste of fifteen years in a still (but perhaps not much longer) short life. I'm sure that the five housewives are tired of a lot of things. Tired ever since their Luddite ancestors were incensed at textile machinery. But that does not give them a birthright to block other people's prosperity and progress, even though the housewives would be labeled "progressives" in today's political nomenclature (what a gross misnomer indeed!). In the end, the societies that will succeed in the increasing exponent of the ATOM are those with the most individual freedom where luddites cannot form a progress blocking cartel. Democracy itself is no guarantee of such freedoms. Majorities gave Socrates hemlock, crucified Jesus, and almost burned Galileo at the stake. Without vigilance democracies have a perpetual tendency to descend into pitchfork democracies, pitchfork rule, at which point they run the risk of being outcompeted by otherwise inherently less efficient authoritarian regimes, and indeed that has been the unfortunate fate of many democracies, especially those that degenerate into majoritarian pitchfork rule. As the pace of everything irreversibly accelerates, so will the relentlessly compounding gap between those societies that make open minded choices vs not. In hindsight, almost always, the seeds of decline are sawn during prosperous seemingly invincible times. I'm afraid so it will be with Silicon Valley. All the enviro-nimby constrained areas of the US represent no more than around 0.15% of the US land surface. Therefore, even a complete doubling of the built up footprint in those areas would, oh heavens forbid, reduce US open space from around 98% to 97.85% of the land mass. It is even less than this, considering, as stated in the main article, how much retail land is being freed up. Gas station land (always in prime locations) is also being freed up. There is plenty of room for new housing even if the first 0.15% is not expanded upon, as this new land is within the first 0.15%. But SV seems content with a landscape of derelict malls, right next to townhouses on narrow footprints that cost $2M. The mall that is right next to Apple's World HQ, is derelict and empty, and has been for years. There are bids to repurpose it, but whatever is done will still take at least 10 years. Counter Argument - If my community is so wonderful that people will pay hundreds of thousands of dollars extra to live there, why change it just to save you money? Go find .15% elsewhere and make it wonderful. As someone who no longer has to deal with Silicon Valley real estate, the fact that there is a derelict mall next to Apple World HQ does come across as hilarious. Though the fact that local government can't make a deal to turn it into townhouses or developer can't turn into whatever institutions Apple workers would spend money at is sad. Drew, if your community is in SV then people do not pay premium price to live in it because it is wonderful, but rather because there is not much else available/allowed. At least not any more than we pay premium price for energy (or at least used to) because OPEC is a wonderful institution. Drew, if your community is in SV then people do not pay premium price to live in it because it is wonderful, but rather because there is not much else available/allowed. Indeed. A recent poll indicated that 46% of the people in the Bay Area wanted to leave if they could, the highest of any metro in the US. For example, as I said above, anecdotally, various medical procedures have waitlists of 6 weeks or more in the entire Bay Area's Kaiser network, whereas in Sacramento, the same procedure can be done on a week's notice. Even surgeons/specialists find the Bay Area to be a poor value for money, and are voting with their feet, resulting in a supply/demand mismatch for medical professionals. I imagine the same is happening for schoolteachers, policemen, etc. San Francisco police have openly conceded that they will not investigate non-violent property crimes anymore, which has led to a rampage of automobile break-ins unseen even in third-world countries. This is an indicator of the Bay Area's shortsightedness catching up with it. Plus, the recent tax reform disproportionately targeted the Bay Area, with a $10,000 cap on SALT deduction, on top of the deduction cap on mortgage interest reduced from $1M to $750,000 for new mortgages (hence reducing Bay Area refinancings). The number of people in the Bay Area affected by this exceeds the combined number in all of TX + FL + WA + OH + PA + MI + the 25 smallest states combined (over 250M people in total). Alas, this is still countered by the fact that the way VC works concentrates new tech company market cap accrual within a 10-mile radius of Stanford, and the immense number of skilled immigrants that come to the Bay Area are unwilling to question the cost of living relative to other options. The question is : Which force cracks first? SV may still offer a marginally more attractive overall package compared to other areas. But the package could have been a lot more attractive to existing residents, not to mention also become available to several other million citizens across the country who currently have no say in the issue. All the high costs associated with SV (housing, labor, services materials and other commodities) trace back to outrageously expensive real estate caused by housing supply restrictions, which in turn trace to the enviro-nimbyism feeding it. But it is too late now. Too late for the distortion to unwind in a controlled manner, since most residents are locked into the pyramid and the positive feedback loop feeding it. I hope I'm wrong, but given the ideology and sentiment of SV residents I do not see many likely scenarios for the gradual unwinding of this huge distortion. On the other hand it cannot wind up indefinitely into more and more tension. Let's see what happens during the next recession. I wonder who will buy $2M SV houses when they start depreciating even at a modest rate, say -3%. The prospect of a $60k annual depreciation on top of an $8000 monthly mortgage and a $25k annual house tax bill is a lot to take in an uncertain employment environment. There's going to have to be a lot of faith in some future longer term appreciation, that is faith to an even bigger bubble, to buy a house in those circumstances -- and at some point that faith will drop below threshold. As I said, the seeds of decline are typically sawn in good, seemingly invincible, times. It is noteworthy that the Federal Reserve's actions have concentrated post-2008 home equity gains in the Bay Area, and even within the Bay Area, in a 10-mile radius around Stanford. Meanwhile, Arizona, Nevada, etc. are still barely at 2007 peak levels. In sheer dollars, the new equity in Palo Alto alone could be meaningful for the entire state of Arizona. This means that any Bay Area housing bust would not have any impact on the national economy, nor would it get any sympathy from the rest of the country, given what the tech industry has done to alienate them. ATOM DUES would be far better, since it goes much further in lower-cost areas than in expensive ones. The high absolute price and property taxes of new purchases means even stagnant prices are damaging. Unfortunately, the Prop 13 landed gentry (five housewives) would still remain mostly unscathed. The worst thing about Prop 13 is that is can be passed onto subsequent generations, which is extremely un-American and oligarchal. 97.6% of CA cities will have to build more housing under SB 35. Anecdotally, I don't see any major uptick in construction since SB 35 passed. HB, your comments are terrific. "The worst thing about Prop 13 is that is can be passed onto subsequent generations, which is extremely un-American and oligarchical." Truly disgusting. Why do those who lecture me unceasingly about fairness and equality not address themselves to the most unfair and unequal aspects of society like this? Why, might I ask, should there be ANY federal income tax deduction for local taxes? Isn't the deduction just a way for local government to steal from the feds? And naturally I support current account budgeting, that is all costs of government must be paid by the beneficiaries of those services in the existing fiscal year, and no costs can be deferred to the next year, or worse, the next generation. If costs exceed revenue, have automatic cuts in spending and increases in tax rates to cover the difference. That way your tax rate directly reflects the choices your legislators have made. People wonder why the government takes more and more, yet provides less and less. The answer is quite simple and horrifying - previous generations took the money we have today, and spent it in the past, to make themselves wealthier at our expense. And if the supply of housing were increased, more tax revenue would be added to the city. Parking lots are taxed at a much lower rate than single family homes. Converting such land would fill the coffers of the local government. But they prefer to spend their grandchildren's income instead. Yes. In particular, the one on March 16 at 1:09 PM is one of the best comments ever in 13 years of The Futurist. There should be none. Particularly when states with no state tax are truly subsidizing ones that have a high state and local taxes. As we draw this thread down to a close (there will be a new ATOM AotM on April 1), I want to list the technologies that are actually working against false price-boosting from artificially-restricted supply (Silicon Valley is the biggest culprit of this, but not the only example in the world). iii) Mass availability of gigabit Internet speeds. v) E-commerce shuttering vast retail land, freeing it up for repurposement. vi) EVs shuttering gas station land (which is not huge in volume, but always occupies a prime location). vii) Construction productivity increases, that can enable a new city to increase supply at a speed that drains people out of Silicon-Valley-type locations. These seven (or more) technologies are quietly toiling away to disrupt the status quo and pernicious effect of artificial supply restriction of real estate in prime locations. Not all of them need to succeed - only one or two do. This is analogous to my famous prediction about oil prices (where six technologies were working against oil, and we didn't quite have to predict which one would win, just that too many were now present for the status quo to persist), and the recent obliteration of taxi medallion prices. Advances tied to the availability of capital - both in the amount of capital available and how easily it can be allocated? There are countervailing forces, such as has occurred with computer power on demand. You would think it would decentralize venture capital and technology talent, but the fact that you could just have six coders in a room instead of several rooms of servers would make the drive to get the best six coders even stronger and thus concentrate talent and capital. Oh - obviously better functioning living and work spaces so that there would be a desire to move or build fresh rather than go through a rebuilding (and slow permitting process) in SV. One level up - the design ability to create a totally new city or other community that functions better. but the fact that you could just have six coders in a room instead of several rooms of servers would make the drive to get the best six coders even stronger and thus concentrate talent and capital. True, but if teams of 6 coders are viable, that reduces demand pressure on SV real estate, since 6 can do the work of 50. If we think that the number of 6-person teams forming rises to a level that swamps SV, even that can't last, as teams of 6 are far more common across the world than world-class teams of 50. SV's advantage was critical mass. This is what really ought to outcompete SV. "false price-boosting from artificially-restricted supply" of? Land? or anything? Airbnb - fights the restricted (and absurdly overregulated) supply of hotel rooms. We would need fewer hotels to satisfy the same demand. The Boring company (why build new roads? Build tunnels). SpaceX BFR/starship - the airport is just a launch pad in the harbor. Bigelow Aerospace - more space IN space! Of these, AirBnB and Drone Delivery certainly assists in puncturing the Bay Area bubble. I don't think flying cars are happening, due to the high safety standards required. Boring may help elsewhere (but not in a seismic zone like CA). AI is interesting, as teams of 6 can form out of top-ranking CS grad schools (most of which are not in dense urban areas) and lead to startups becoming fully viable in Ann Arbor, Urbana-Champaign, Cleveland, Pittsburgh, etc. That could be the way to make new startup formation truly detached from SV. A team of 6 CS grad students just start a company, get funding, and then keep hiring other grads from the rest of the university. It may need nothing from SV even up to the point of growing to 200 people. Exorcising housing unaffordability with moralistic slogans. Many people, way too many people, have the wrong perception of why housing is becoming more expensive (as if "greed and money" in housing were a new thing that modern, more evil minds, recently invented!?!). This misconception seems likely to increase. There is no mention of the most obvious cause: Ubiquitous global supply restrictions and the enviro-nimbysm feeding it. The mechanics through which enviro-nimbysm enters legislation and regulation is different in different countries. But the underlying cause is the same. There is no mention of it because you cannot get elected, sell films or write popular articles that require the very reader/voter to vomit a practice that has been so dear to him/her for so long. However, on the bright side, when there's mass misconception, there's money to be made by arbitraging the reality. Those who cannot afford housing will bite into the narratives and dig the holes they're in even deeper. Hopefully readers of this blog will be smarter and become the arbitrageurs. Cities grew by building housing on cheap, empty land. As the city keeps on growing the availability of such land does not decrease, it just migrates further from the city center. So the obvious solution is to go back and densify the older neighborhoods. But those older neighborhoods realize that densification reduces their property values. The problem is especially acute in California - as property values increased, taxes on the older stock of homes should have increased, forcing out marginal residents, increasing turnover, and increasing the likelihood of densification neighborhoods. There are single family homes blocks from LA skyscrapers. Think about that for a moment. Over time, a larger and larger share of these metros’ land is taken up by dormant single-family neighborhoods that are failing to add any new housing. The dormant suburban sea is so vast that if even modest gradual redevelopment—tearing down one single-family home at a time and replacing it with a duplex or a small apartment building—could grow the housing stock immensely. The solution is really simply - relax zoning laws, and change the fee structure. True. But even existing single family homes are nowhere near the main problem. The main problem is that zoning laws prevent defunct non-residential land from becoming residential, as we had discussed above. As more strip malls go empty, this problem will become more visible. The acreage of many strip malls is higher than people think, due to the size of the parking lots. A visit to Google Earth or Google Maps Sat View confirms this. But yes, basic principles of city management are being ignored outright. Most US cities have average ages of 30 years or more. It should never have been allowed to get that high, meaning that ongoing construction should have kept the average age below 30 years.